In celebration of Black History Month, here’s a full unit that incorporates art, history, reading, writing, and discussion that Explores the works of Langston Hughes, Jacob Lawrence, Helene Johnson, and Paul Laurence Dunbar. 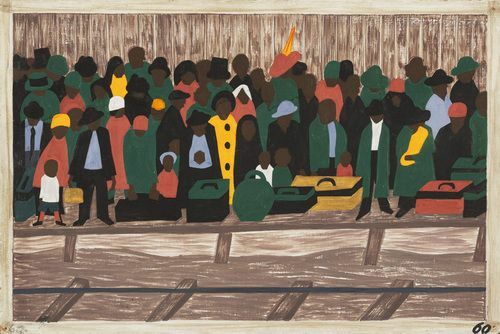 How do Jacob Lawrence’s painting, Langston Hughes’ narrative, Helene Johnson’s poem, and Paul Laurence Dunbar’s poem represent the life and changing roles of African Americans during the Harlem Renaissance and The Great Migration? Identify how the painting and poem reflect at least one aspect of modern life in the United States. Examine how Johnson uses poetic devices, such as imagery, word choice, and rhythm, to create tone and meaning. Analyze the way visual effects interact to create tone and meaning in Lawrence’s painting. Compare and contrast the ways Hughes and Dunbar represent the role of African Americans in the past. Reflect on the historical context of these works of art. Provide the students with some historical background about each of the artists, including Jacob Lawrence, Langston Hughes, Helene Johnson, and Paul Laurence Dunbar. Display Lawrence’s painting “And the migrants kept coming” from 1941. Ask students to reflect in their journals on their initial impressions of this piece of art prior to being given any information. Lead a Think-Pair-Share activity. Guide students in a whole-class discussion: What might be happening in the picture? What emotions does the painting evoke in you? Does the painting remind you of any other story, art, or experience? How does the artist’s use of color, shape, and lines create an impression on the viewer? Who is the subject of the poem? What words does the poet use to describe the subject? What is happening in the poem? Who does the poet refer to with the term ‘kids’ in this poem? How is this poem relevant to the time period in which it was written? How is it relevant to today? How does Johnson’s poem portray the history of African Americans in comparison to Hughes’ portrayal? How are they different? Read aloud the poem “We Wear the Mask” by Dunbar. Ask students to create a Venn diagram to compare and contrast Dunbar’s poem with Lawrence’s painting. Encourage them to compare the subjects of both pieces of art. How is the tone, mood, and imagery the same and different between the two pieces? Ask them to draw conclusions about the mask in Dunbar’s poem and how it relates to the subjects in all of the other material discussed during this unit. How do the works that were shared in our class represent and symbolize the changing roles of African-Americans between the late nineteenth century and 1941? How are these artistic representations relevant in today’s society? Participate in similar activities with music. Discuss the impact of rhythm, lyrics, and instruments on various songs. Compare and contrast music by African Americans of the past with music of today. Some possible artists to include: Miles Davis, Billie Holiday, Louis Armstrong, Aretha Franklin, Jimi Hendrix, Janet Jackson, Lauryn Hill, and Kanye West. Learn more ways to discuss Black History Month into your classroom.